ABC Wine Ratings and Reviews: Fall Into Great Deals from Wine.com! Fall into great deals from Wine.com. 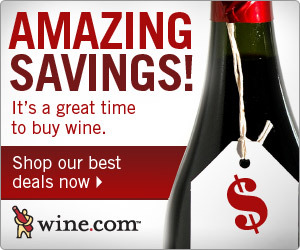 From the everyday shopper to the serious collector, Wine.com has savings for everyone, everyday. Top rated wines under $20, fine wines up to 50% off retail, and great deals on wine from every wine region and varietal from around the world. Consider, for example, this delightful ABC gift basket : Hanna Winery's Estate 90+ rated Sauvignon Blanc complements this beautiful hand-woven bamboo basket filled with gourmet treats that includes Camembert cheese, smoked almonds, wine and cheese biscuits, focaccia crisps, French picholine olives, and more!